On Wednesday morning, June 28, 2017, a married couple received injuries after being “butted” by a bison at Mud Volcano, just north of Lake Village in Yellowstone National Park. The Heber City, Utah, couple was taking photographs on a boardwalk at Mud Volcano, when a bison approached them. 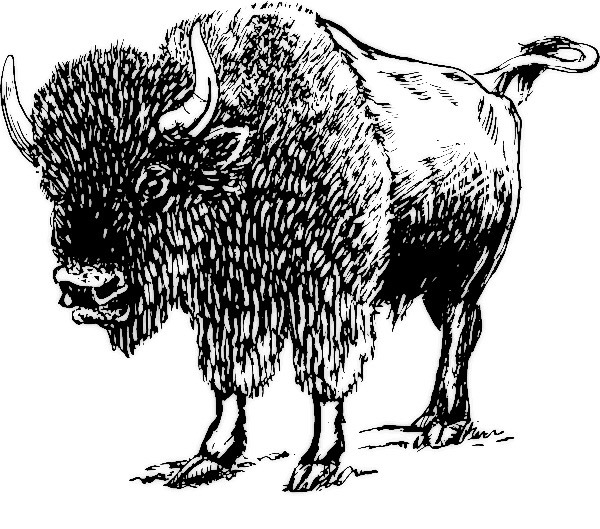 The bison butted The wife, age 72, who then fell into her husband, age 74, and both individuals fell to the ground. Park rangers responded immediately and evacuated the couple from the trail, a quarter mile, to the road. The couple was transported to the Lake Clinic. The husband had minor injuries, and the wife was transported by Life Flight to Idaho Falls, Idaho. She was in stable condition. Citations were not issued to either individual. When an animal is near a trail, boardwalk, parking lot, or in a developed area, give it space. Stay 25 yards away from all large animals – bison, elk, bighorn sheep, deer, moose, and coyotes and at least 100 yards away from bears and wolves. If need be, turn around and go the other way to avoid interacting with a wild animal in close proximity. This is the first confirmed incident of a bison injuring visitors in 2017. In 2015, five people were injured after approaching bison. MAMMOTH HOT SPRINGS, WY – Park service officials are offering a $5,000 reward for information leading to an arrest in connection with the death of a wolf in Yellowstone National Park in April. Last month, we told you about the injury and euthanization of a popular member of the member of the Canyon Pack. Now the National Park Service said a study by the U.S. Fish & Wildlife Service Forensics Laboratory in Ashland, Oregon, has learned more about the injury. Preliminary results from the necropsy of the Canyon Pack alpha female wolf showed that she suffered from a gunshot wound .. National Park Service law enforcement believes the wolf was shot on the north side of the park, near Gardiner, or near the Old Yellowstone Trail which is located in the park on the northern boundary. The incident likely occurred sometime between April 10 at 1 a.m. and April 11 at 2 p.m. The wolf was one of three known white wolves in the park. She had at least 20 pups, 14 of which lived to be yearlings, according to the Park Service. Anyone with information is asked to contact the National Park Service Investigative Services Branch (ISB), via the ISB Tip Line at 888-653-0009 or online at http://www.nps.gov/isb. MAMMOTH HOT SPRINGS, WY – Yellowstone authorities are trying to determine how a popular wolf became injured. The female was part of the park’s Canyon Pack android was one of three known white wolves in Yellowstone. 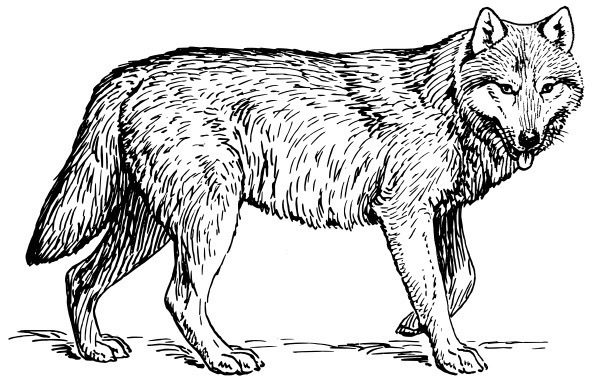 This wolf lived to 12 years, twice the age of an average wolf in the park and had a broad range that extended from Hayden Valley to the Firehole River area to the northern portion of the park. For these reasons, the wolf was one of the most recognizable and sought after by visitors to view and photograph. On April 11, 2017, hikers discovered the severely injured wolf inside The park near Gardiner, Montana. Park staff concluded the wolf was in shock and dying from the injuries. Staff agreed the animal could not be saved due to the severity of its injuries and the decision was made to kill the wolf. An investigation into the cause of the injuries has begun which will include a necropsy. Mammoth Hot Springs, WY – Dakota D. Tipton, 26, of Joshua, Texas, was sentenced Tuesday, July 26, 2016, for carving his initials into the iconic Roosevelt Arch. U.S Magistrate Judge Mark Carman ordered Tipton to serve three days in jail, pay a $250 restitution fee for repairs, and $40 in court fees. 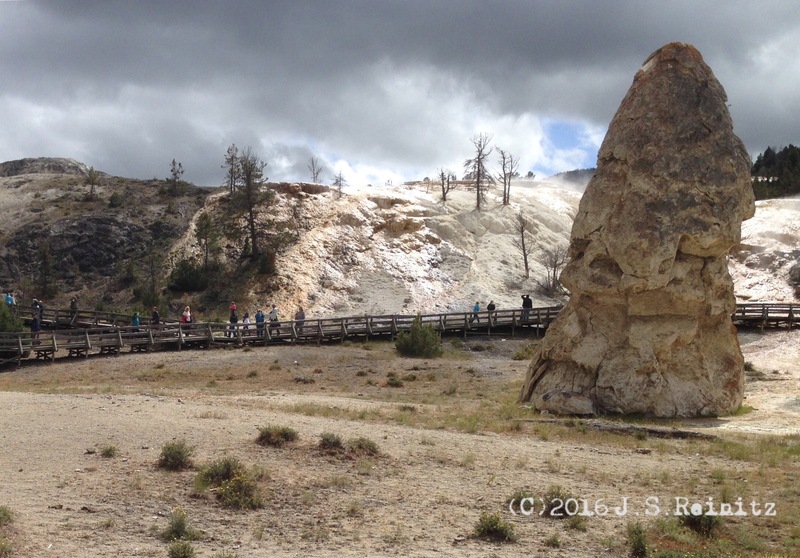 It wouldn’t be a trip through Yellowstone without a stop at the geysers, thermal pools, hot springs and other volcanic features. My shots of Old Faithful weren’t the great because the steamy eruption blended in with the overcast day. 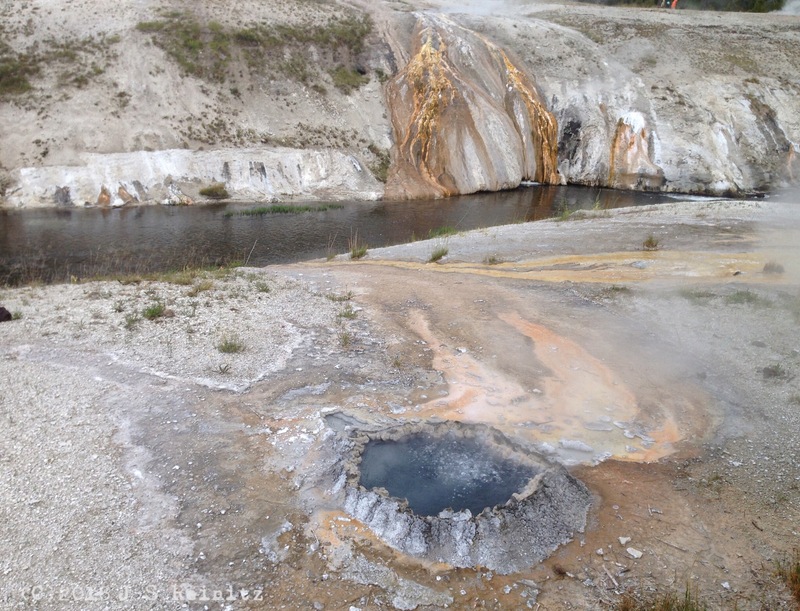 But here are shots of a pool boiling away in the Old Faithful area and Mammoth Hot Springs. I found this on the driven into steps to Yellowstone Lake just behind the visitors center at Fishing Bridge. 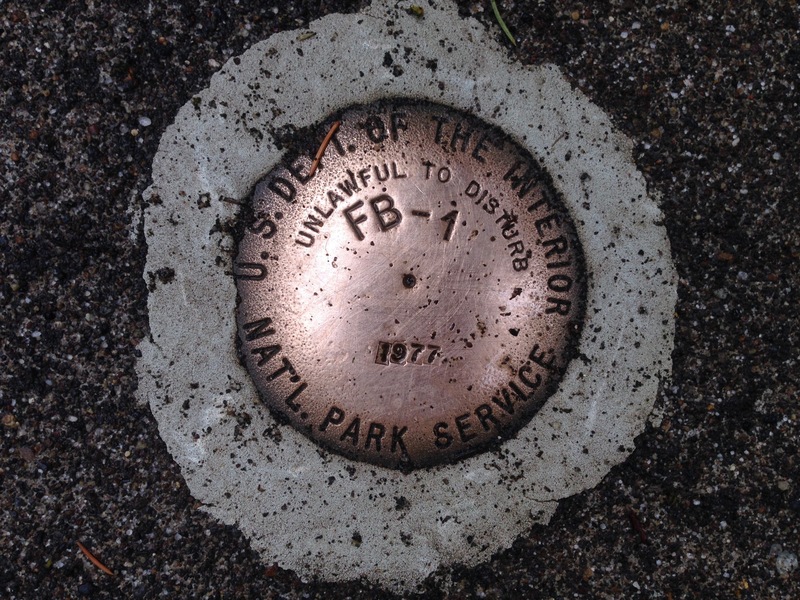 At first I thought it was a USGS marker, but I haven’t been able to find it listed in the Survey’s databases. Here’s another shot from our cross-country voyage through the American northwest. 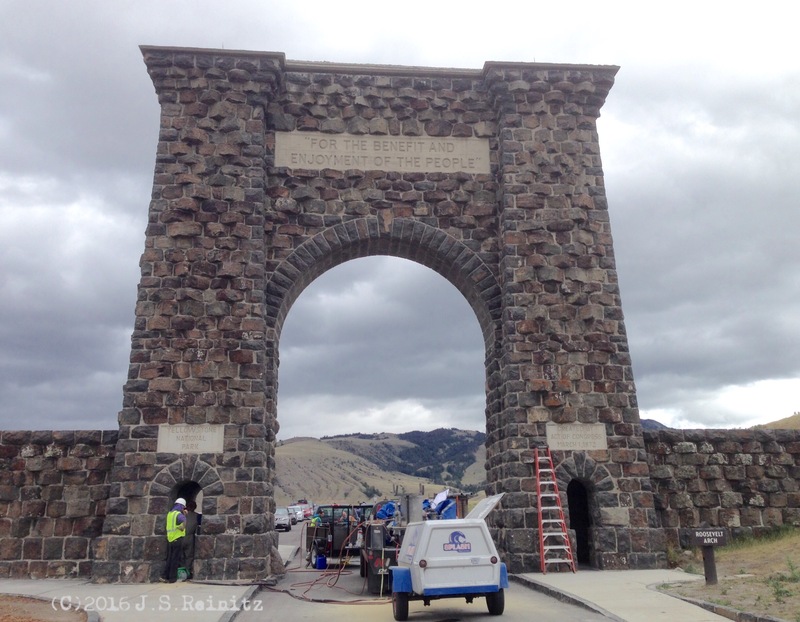 This is the iconic Roosevelt Arch at the North Gate to Yellowstone National Park, which was undergoing an iconic sandblasting. It was built in 1903 at the park’s first entrance and contains a time capsule.